Of the $1.71 trillion in Federal, State, and local government personal transfers payments in 2007, $326 billion went to nonmetro residents and $1.39 trillion went to metro residents. On a per capita basis, nonmetro residents received more transfers than metro residents, $6,533 vs. $5,516. With per capita income of $28,781 in nonmetro areas and $38,615 in metro areas, government transfers accounted for 22.7% of nonmetro and 13.6% of metro income in 2007. The federal transfer difference served to lower the metro-nonmetro per capita income gap in 2007, from 63.9% without federal transfers to 70.5% with transfers. Nonmetro per capita transfer payments have been rising faster than metro since 1978. The majority of this increase is due to the rising cost of medical care, retirement, and disability payments. Nonmetro areas have an older population and a higher proportion of disabled persons than metro areas and thus depend more on transfer payments for retirement and medical costs (Jones, et al. 2009). In 2007, medical benefits accounted for the single largest transfer payment category in both metro and nonmetro areas. In 1978, medical benefits accounted for 18.9% of all nonmetro transfer payments—the second largest category—and by 2007 these had risen 43.4%, making it the largest category of all nonmetro transfer payments. Similarly, in metro areas, medical benefits increased from 22.7% of all transfer payment in 1978 to 45.1% in 2007. Overall, between 1978 and 2007, nonmetro transfer payments for medical benefits increased 480% compared with 412% in metro areas. Some of the increase in metro and nonmetro transfer payments for medical benefits can be attributed to legislation expanding health insurance to children in working families through Medicaid and the State Children’s Health Insurance Program (SCHIP). However, the rising cost of health care, which has far outstripped the overall rate of inflation, is a major source for this increase. Transfer payments for retirement and disability insurance are still increasing, but in contrast to medical benefits, have been declining as a percentage share of total transfer payments. In 1978, nonmetro retirement and disability payments accounted for 51.7% of total transfers; by 2007, this percentage had fallen to 38.1%. Nonmetro retirement and disability transfer payments increased by 86.4% in this period. Metro retirement and disability payments fell from 46.1% of total transfers in 1978 to 35.0% in 2007 and increased by 94.9% in this period. Retirement and disability payments will increase even more in the future as the baby boom generation moves into retirement. Government transfer payments are expected to make up an even larger share of nonmetro income as the population ages and baby boomers migrate to rural America (Cromartie and Nelson, 2009). Jones, C., Parker, T., Ahearn, M., Mishra, A., and Variyam, J. (2009). Health status and healthcare access of farm and rural populations, EIB-57. 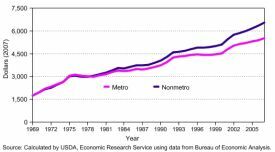 Washington, D.C.: U.S. Department of Agriculture, Economic Research Service. 1Percentages are shown for selected programs. 2Includes expenditure for food under the WIC program, foster home care, refugee assistance, adoption assistance, earned income tax credits, and energy assistance. Note: The 1978 estimates were adjusted to 2007 dollars using the CPI-U. Source: Calculated by USDA, Economic Research Service using data from the Bureau of Economic Analysis. Timothy Parker (tparker@ers.usda.gov) is a Sociologist in the Economic Research Service, USDA. The views expressed here are those of the author, and may not be attributed to the Economic Research Service or the U.S. Department of Agriculture.